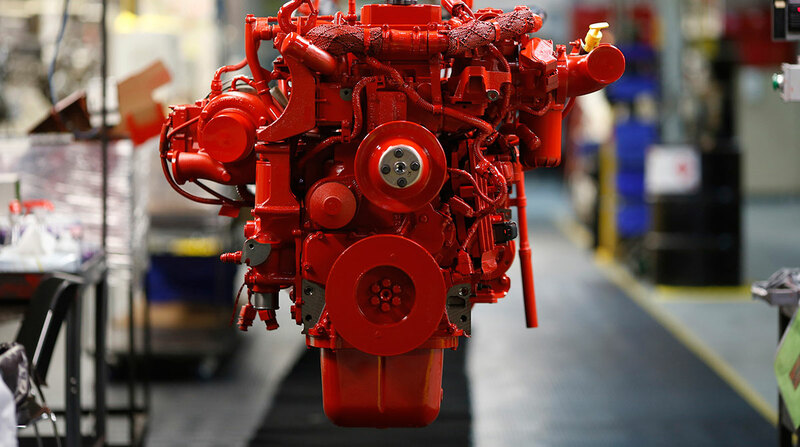 Independent engine maker Cummins Inc. supplied the most diesel engines used in Class 8 trucks in North America in the first half of 2018, as it did a year earlier, although its overall market share dipped, WardsAuto.com reported. Cummins barely pulled ahead of Detroit Diesel Corp. to lead in engines 10 liters and over and dominated in engines under 10 liters. A Cummins executive pointed to three engines — the X15, X12 and a 9-liter — as driving the company’s success and underscored the work by its employees to keep up with truck makers’ near-record levels of production. The company introduced the X15 engine in July 2016. The X12 became available this year. The L9 was introduced in 2017. “We have had to have not only a good product, but deliver on increasing demand for that product in a pretty challenging ramp-up,” Rob Neitzke, Cummins’ executive director for North America truck OEM business, told Transport Topics. The total number of Class 8 diesel engines installed in the first half of 2018 rose 25.7% year-over-year to 141,474. Cummins supplied 52,486, or 37% of them. In the first half of 2017, there were 112,511 engines, and Cummins earned a leading 37.3% share with 42,062. The figures come from a Ward’s report on North American factory sales of heavy-duty trucks, including their engines, released July 31. The report breaks Class 8 engines into two segments, with 10 liters as the dividing line. Turning to engines 10 liters and over, Cummins notched a leading 32.3% share, or 41,741 out of 129,100. Detroit, a unit of Daimler Trucks North America, was right behind with a 31.3% share, or 40,473 engines. A year earlier, Detroit led in the heavier category with a 34.4% share, while Cummins earned a 32.3% share in that period, too. Paccar Inc.’s truck brands — Kenworth Truck Co. and Peterbilt Motors Co. — together accounted for 66.3% of Cummins engines in the heavier class, up from 66.1% a year earlier. International Truck used the second-highest number of heavier Cummins engines — 11,483, up from 8,284 a year earlier. At the same time, all truck makers increased the overall number of proprietary engines with one exception. Mercedes-Benz engines plummeted compared with a year earlier — to 94 from 2,493, due to the near disappearance of its lighter Class 8 engines. Mercedes-Benz is an in-house brand of DTNA. Paccar used 16,894 of its MX engines compared with 12,968 a year earlier — supplying them almost equally in its Kenworth and Peterbilt brands. Volvo Trucks North America used 14,628 of its own engines, all 10 liters and above, compared with 8,428 a year earlier. “Volvo engines are spec’d in well over 90% of the trucks we’re building, and that’s largely a result of the market preferences shifting toward lighter, more fuel-efficient 13-liter and 11-liter engines,” said Magnus Koeck, vice president of marketing at VTNA. It used 977 from Cummins compared with 607 in the 2017 period. “Of course, we’re seeing demand in very heavy operations and in mountainous regions for larger-displacement engines, and we maintain a strong partnership with Cummins to offer their products in those segments. We’ve recently brought the Cummins ISX12N natural gas engine to our VNL series to address the niche natural gas market,” Koeck said. Mack Trucks’ engines increased to 10,943 compared with 9,069 in the first six months of 2017.
International used 4,418 heavier engines of its own compared with 1,886 a year earlier. International is a unit of Navistar Corp.
Navistar Chairman and CEO Troy Clarke said during the company’s latest earnings conference call that Navistar’s 15-liter engine has about an 18% share of the 15-liter segment. Its new 13-liter engine, introduced in 2017, is in the range of 8% in its segment, he said. “Probably at the rate we’re going, this time next year we’ll be, hopefully, equivalent to where the 15-liter is,” Clarke said. The Ward’s report showed Cummins as the undisputed leader in Class 8 engines under 10 liters. Cummins earned an 86.8% share in the category with 10,745 engines out of 12,374. Freightliner, also a unit of DTNA, used the most from Cummins in the lighter category, 7,021, up from a leading 6,982 a year earlier. International was next highest with 2,517 engines, up from 2,046.
International saw sales of its engines less than 10 liters fall to 174 compared with 832 in the 2017 period as the OEM began to shut down production of its N9 engine. Paccar’s lighter engines increased to 1,012 from 700 in the 2017 period. Paccar makes the PX9 engine in that category. Meanwhile, analysts said questions over Cummins’ growth potential, plus concerns over the cost of its massive emissions-related recall campaigns of 732,000 light-, medium- and heavy-duty trucks, helped to drive Cummins’ stock down to $141.61 on Aug. 3 compared with $192.50 on Jan. 26 — the year-to-date high. Cummins believes its stock is undervalued. “Our view is the earnings of the company are incredibly strong. Our incremental margins are good. And we don’t think we’re at the peak. We think we’ve got quite a bit more room to run,” Cummins Chairman and CEO Tom Linebarger said in a recent earnings conference call. On Aug. 8, Cummins announced it would repurchase $500 million of common stock, noting the move is consistent with the company’s plans to return 75% of operating cash flow to shareholders in 2018.